Artificial Intelligence radically affects every industry, nearly every job, most likely including yours. In this forward-looking conversation with author Lasse Rouhiainen, you’ll gain insights about what AI will do and how you can stay ahead of the disruption curve. Mark S A Smith: My guest today is Lasse Rouhiainan, who just released the book Artificial Intelligence: 101 Things You Must Know Today About Our Future. 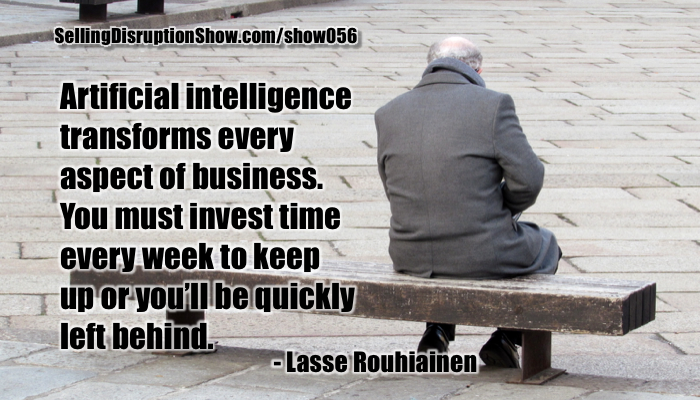 I’ve known Lasse for several years, reading a number of his extraordinary books written at the executive level, telling you exactly what you need to know about technology to profit from it, and I had to invite him on the show after reading his newest book. Welcome, Lasse. Lasse Rouhiainan: Thanks, Mark, for that introduction, and excited to be here. Mark S A Smith: It’s going to be a great show. You have to dug into what’s going on with artificial intelligence and laid it out in about 101 short little segments that really dig into the questions that every executive needs to understand and every entrepreneur needs to understand about artificial intelligence to stay ahead of the game. What do you see as being the biggest potential challenge that artificial intelligence is going to be bringing to disrupt business? Lasse Rouhiainan: That’s a big question. One of the most important things is that it’s coming faster than business people can realize, and its impact will be bigger than people can realize. Those two things are really significant because people think that, “Oh, I will study artificial intelligence for the next three years and then let’s see what happens,” but these things are happening instantly and people don’t understand that they will impact everything, not only every business, every business process and industry, but also our life. Mark S A Smith: Indeed. In fact, everybody listening has been enjoying artificial intelligence for a while now because everybody listening buys from Amazon.com, and all of the recommendations come out of AI-based engines. Lasse Rouhiainan: That’s a perfect example. We all use it in our daily life in some shape or form, but, right now, what is happening is that it’s coming in a bigger way, and all of the major tech companies, like Google, Facebook, Amazon, Microsoft, and IBM, they have all said that AI is the number one focus, so, right now, what we will see not only on Amazon and not only when we’re shopping online, but kind of like everything we do. That’s why it’s so significant, and I think that’s why people should pay attention and learn these things really quickly right now. Mark S A Smith: What do you think is the biggest impact that AI is going to have on business? I would say that these kind of things, we will start to read in the news really soon because people who understand how big this AI thing is, they can apply it. Then I also see a lot of people who think that, “Oh, it’s only something I see in the movies,” or, “I don’t believe it’s such a big thing,” or they say, “I don’t believe that it will affect my job. It will affect everybody else’s, but not mine.” That’s the biggest thing. Mark S A Smith: Indeed. In fact, you, in the book, give the example of the Wall Street stock trading company that replaced 600 traders with two people and AI. This is already happening. It’s happening fast. Mark S A Smith: Right on. Lasse Rouhiainan: And there will be really few people working in banks. Everything which has to do with numbers and some kind of routine work, all those work will go to AI or robots really soon. Mark S A Smith: For banks, I think that they’re just absolutely doomed. Give me one good reason to go to a physical bank location. Just one. Mark S A Smith: One good reason. Mark S A Smith: Oh, the lollipops as you go through drive-through. No, that’s not a good one. Mark S A Smith: Safety deposit box. That’s about it. Lasse Rouhiainan: Maybe to take a picture to show how they look like. [crosstalk 00:04:43] we can show that as a case study of our industry. Mark S A Smith: That’s exactly right. There’s just no reason, and with blockchain, crypto, of course, is a big thing going on right now, and without a doubt, AI is taking care of issues such as fraud and all the other things that other bankers would have had to go in there, “Well, let’s take a look,” but it’s massive destruction everywhere. You talk about in the book just some ideas of how to figure out if AI is going to disrupt your job. You referenced a particular site called Is a Robot Going to Take My Job, and I posted it on Facebook and people are commenting on it. Interesting idea. Is everybody … Well, not everybody. There are a few jobs out there that are not going to be impacted by AI, at least in the near future, but for the most part, anything that requires formulas to get the job done is going to be gone. Lasse Rouhiainan: You’re right. That’s the chapter number five, and maybe that’s the most important chapter because that will change life and societies all over the world, so everybody should be paying attention. All the politicians and leaders of the institutes, they should all talk more about it right now because it’s coming so fast. First thing is that robots and automation and AI, they will change different tasks. For example, there are people that, in their daily job, they are now doing 30 different tasks, and in the short-term future, robots and AI will maybe do 10 out of those 30, so that’s the first stage of automization that we will have. Then, obviously, we will have a lot of these jobs, like if you are working only with numbers or if you are a truck driver or if you are working as a cashier in a shop, those kind of jobs will go quite soon. If we don’t pay attention to that, it will also cause a lot of unrest and all kinds of problems in this society. Mark S A Smith: You quoted the book, Dr. Kai-Fu Lee says, “Every job, which takes less than five seconds to think, will be done by robots.” That just illustrates on two sides. Listener, if you are in that role of a low-cognitive capacity situation, it’s time to upgrade your skills and your cognitive capacity, and if you have those people in your business, you have to start looking for ways of using AI. Otherwise, you’re going to be costed out of your business. On the other side, we have to figure out ways of moving people into real jobs that they can contribute that AI can’t quite do/won’t do for a while. You talk in the book about the impact of AI on jobs and on society, and there’s a lot of folks out there that are screaming, “Gloom and doom.” First of all, this is a hard, unstoppable trend. Anybody who thinks they can put the brakes on this is deluded because you can put the brakes on one place, it’s just going to squirt out someplace else and be developed. It’s just going to happen, so we do indeed have to pay attention to this. We take a look at history and remember the classic saboteurs who took their shoes, their sabots, and bashed the weaving machines in France thinking that they would lose their jobs because the weaving machines would take away their … They found new business. They found new places to go, and I really truly believe that there is huge numbers of jobs that are yet to be invented that will soak up a lot of people. One of the problems here is that these new jobs, and there will be plenty of them, but, many times, they don’t match those skills that you need, are not the same skills that, right now, somebody whose job will be lost thanks to AI, has. That’s the skill problem. All of the sudden, we will have hundreds of thousands of people who will be in the first stage of losing their job, and it will take some time. They need to learn new skills so that they can do those new things. If we start working with this right now, it will be really good. It’s all about re-education and lifelong education. Mark S A Smith: Chatbot customer experience designer. Lasse Rouhiainan: Exactly. There you go. Chatbot designer, but if you say, now, people are like, “Oh, I don’t know,” but five years, even two years from now, it’s really demanding job and it’s great and, actually, there will be lack of people who know how to do it. That’s just one example, or everything related to self-driving cars and that industry and people who are doing things to help make the self-driving cars. I would like highlight the fact that we all need to start talking about these issues, and that’s one of the reasons I wrote the book is just to get more conversation going. Mark S A Smith: Well, you cover a lot of ground in the book. You talk about self-driving cars. You talk about chatbots. You talk about robotics and manufacturing and just day-to-day operations. You explore the leading edge. There’s lots and lots of references and ideas and websites and examples and case studies of where it’s happening right now in a lot of industries. For example, Walmart using robots to do inventory, and they can do it today twice as fast with robots as they can with humans, and I expect for that to actually move towards about a tenth of time versus humans as that technology develops. Of course, every year, you got to go to Consumer Electronics Show here in Las Vegas so that you see what’s coming, and this year, there was a lot of robots, a lot of sensors, Internet of Things, sensors everywhere, which allows AI to do a better and better job of identifying and predicting and implementing and executing on ideas. It’s an interesting moving target. Listener, you got to stay on top of this if you’re going to survive. This innovation’s being forced on you so you got to dig in. One element that I thought was interesting in your book was you had a list of 64 jobs that will disappear in the self-driving car era, and I see self-driving cars as a massive force in the next 1,000 days or so. So many different jobs disappear. I was in Baton Rouge, Louisiana, just last week, and their road infrastructure is just not keeping up with the growth of the city, and right now, if the city council decided to tear up roads and put in new roads, they would be totally unnecessary in the next decade. What they need to do is essentially just deal with it for the next three or four years, and there’s plenty of room when cars are driving a meter apart. Lasse Rouhiainan: Exactly. You’re totally right there, and self-driving car, it’s something that comes and once it’s here, we will never go back. It’s not like, “Oh, I don’t need to pay attention to it.” It will have a lot of undirect impact. For example, the insurance business. Mark S A Smith: Oh, sure. Lasse Rouhiainan: It will change dramatically. If you are person selling insurances for cars, then it’s good try to learn something new, get a new job and so on because it will change. Also, over there in the US, you have a lot of parking lots. That’s interesting because many of those, we will not need them because self-driving cars, they normally go and park somewhere really far out from the city, so, therefore, parking lots that are in the city probably will be turned to real estate and housing and so on. Lasse Rouhiainan: Basically, this will change the whole cities, how cities are being designed and everything. It’s a huge change. Obviously, the biggest benefit that we will save a lot of lives. My response to that is twofold. Number one is, “Your car gets hacked on a regular basis. It’s called beer.” Number two is, “Has your cellphone ever been hacked?” “No.” We’re using the same technology. We have a high level of security that we’ve well understood in the world of cellphones has to do with the electronic serial number, the fact that we’re looking at every device on the network. If two devices show up, then we disable them both. We can take care of that security element. It’s not a technology issue. It’s a psychology issue. Quite frankly, I can’t wait for self-driving cars to come into play. It’s going to save us so much time, so much energy, so much heartache, and AI is at the core of all of that. What else do you see as being radically changed? Lasse Rouhiainan: Thanks to this, AI will pave a way to all kinds of new kinds of ideas that traditionally we would say that they are crazy ideas. If you have a idea or your friends have an idea or your colleagues, and the first thing that comes to mind is that’s a crazy idea or that would never work, maybe thanks to AI, it will work. In other words, it will enable things that used to be impossible. For that reason, I would recommend every business professional and executive study these things at least four hours a week because studying and learning from examples and seeing what’s happening, you might come with ideas about different services or products or you might find that your competitors are already doing sort of things. I would say it’s totally different paradigm when we work with AI because if all of your competitors all of the sudden start working with AI or applying AI, and there’s also one thing I highlight in the book, that you don’t have to be Google or Facebook or these big companies to apply it. You can go to the big companies, and you can buy AI from them, right? Lasse Rouhiainan: That’s also really important point to understand. That would be the number one thing is just to start spending some time and also start spending some resources in it because if you don’t, your competitors, in a few days, they might be doing it. People who survive are the ones who know how to look behind the corners. He’s always thinking 5 years or 10 years ahead and we have a lot of people who are thinking about this quarter or this month or this week, and it’s not so good. I highly recommend everybody to start thinking how their business processes or their industry, how it will look like three years from now or five years from now, and then you start doing products accordingly or start creating something new that right now, in this moment, it sounds crazy or it’s impossible or it’s a stupid idea, but maybe, in three years, it will be amazing idea, and you are the only one who is doing it. Mark S A Smith: We are at that really, really steep part of Moore’s Law curve, which predicts how much technology will be available when it comes to compute power. Ask Blockbuster, the company that had 9,000 stores distributing DVDs and before that, VHS tapes, that completely went out of business six years ago thanks to Netflix, and Netflix was built on the concept of some day, there will be sufficient bandwidth for us to stream high resolution movies into people’s houses. Let’s get ready for that. That’s the kind of crazy thinking that AI is going to bring to the next three to five years, and, friends, if you’re not thinking about how you can capitalize on eliminating labor, AI takes labor out of the mix, and increasing the probability of success. For example, Lasse, in the book, you talk about healthcare and the fact that AI does as well and soon better than oncologists at determining the best plan of attack for a cancer patient, and the reason why is the AI takes into account everything that is known to the system at the moment versus the doctor, which has to keep up with what’s the latest technology and, oftentimes, doesn’t or he can’t. Lasse Rouhiainan: There you go. I would say that healthcare is the number one benefit if we think about it because that will give us better health, and we will also live longer. By the way, that’s an amazing business idea for many, many people to think because in the future, people will not be living until 60 years or 70 years or something like that, but they will be living 100, 110, 120 and so and so. There’s business ideas you can start thinking how you can offer them services and so on, but healthcare for sure is one of those amazing things, and, basically, all of us will have AI doctor where our smartphone, we take a photo of ourselves, and it will say what’s going on, and we can move from there. Mark S A Smith: I see healthcare being absolutely disrupted by AI because, if you think about it, you go to the doctor’s office, they’re chatbots. They say, “Hi. I’m Dr. [Olsen 00:18:57]. How may I help you? And how long has this been happening? Is there any rash, fever, sore throat?” It’s a chatbot. You listen to a doctor doing a diagnostic, and it’s the same words over and over again with a branch, and what happens is 90% of the time, you can help a person through their current health issue remotely. They don’t even have to show up. With all the Internet of Things sensors, with the sensors that people are wearing for exercise and the ability to take pulses and blood pressure, with cameras being able to take temperature and heart rate and breathing rate, it’s just stunning the amount of information that can be gathered with the sensors that people are using today. We pour that into an AI health application, and you just don’t need to go to the doctor for 90% of the issues. Lasse Rouhiainan: That’s true. I talk at the end of the book where it’s also true that thanks to these technologies, we will have a lot of people who are only communicating with screens, whether it’s their iPhone or smartphone or computer or something, and since the computer and smartphone is getting so much more powerful, it can do all kinds of things in really short period of time. They will stop lacking in the human interaction, and when there’s some new job, the people we need in the future are those people who have human skills, like emotional intelligence and so on. One of the problems that we should worried is to have people spending too much only with technology because they will become less human, and we already see this. There are some statistics that, for example, depression and anxiety have gone up for people who are only in social media because it starts to be some kind of simulation of their reality, not their reality, right? Lasse Rouhiainan: Then when those people need to communicate or negotiate and do those kind of things, they cannot do any of those things. That’s one thing that’s good to take into consideration, and there’s a lot of work for people who help others getting out of depression or anxiety and those kind of things. Mark S A Smith: You give some interesting examples about AI that actually provides some coaching and some psychological support that people become addicted to. Fascinating. Mark S A Smith: Not me! Lasse Rouhiainan: Exactly. Exactly. There you go. When the chatbot or AI is asking, “Hey, have you been drinking,” normally, they’d tell the truth, and that’s amazing if we think about it. Thanks to chatbot, in some cases, we can give the help better and faster to people because they tell the truth. It’s really fascinating how technology works there. Mark S A Smith: Indeed. Well, people don’t feel like the chatbot’s going to chastise them. “No, you’re not going to come down on me.” You point out in the book that the tasks that require basic human qualities will probably not go over to AI for a while. You create this list, empathy, intuition, emotional intelligence, you mentioned that earlier, negotiation, which you just mentioned, complex communication, which I think is an important component, coaching, and creativity. What we’re seeing here is the more creative that you can be, the better you can be at communicating, the better you can be at invention, the more likely you’re going to stay ahead of the AI revolution. Tell me more about some of your insights from that from your book. Lasse Rouhiainan: Creativity is the number one thing that many experts say that it’s more difficult for robots and AI. Obviously, there’s already robots who can dance or who can do something, but they only can do that. If you want to take them to do something else, they cannot. That’s the special human capability that we can do many, many different things. Creativity is something we should enhance in our business, but also for younger people and in the schools in university and so on, and creativity is also a skill of creating something out of nothing. I don’t remember who said it, but some of the AI researchers said that AI’s really bad of creating something out of nothing, and that’s kind of like a human job. Everybody will have their old business. Even if you’re working for some company, thanks to AI, in the weekend, you can have your own business because AI is helping you, and that comes from the creativity. Mark S A Smith: I think that’s an important point to make is that AI, for most of us, is going to be like an assistant. It’s going to help us do better work at we do. It’s going to relieve us of a lot of the mind-numbing tasks. It’s going to keep us from making mistakes, and it’s going to allow us to be much more effective. Instead of just having a screwdriver as a tool, we will have AI as a tool. It’s going to assist us in our cognitive capacity. Interestingly enough, in this year that we’re recording this, 2018, there is some predictions that half of the workers in the United States will have a side hustle. As we move it into this gig economy where we don’t work for corporations, we perform tasks as necessary, I live in the gig economy, people hire me for consulting jobs, I do it, I leave, I do a speech, I leave, everything’s a gig. You do something very similar. Mark S A Smith: I see that AI supports that gig economy, which, quite frankly, brings a lot more money and a lot more satisfaction to the job. Lasse Rouhiainan: Exactly. That’s so true. Also, for young people, or even, let’s say, people who will lose their jobs thanks to AI, the fastest way to make some extra money is going to some freelance sites, for example. You can start there and you can start then building your website and your reputation and getting people to hire you, but I would say that’s one of the most important business skills nowadays is how to promote yourself, and I’m also teaching this in the University of [inaudible 00:25:42]. Many students are excited because they know that, “Oh, not only I know how to use Instagram for myself, but now I can manage Instagram account for some company during the weekends and some extra money.” I think that’s extremely important. Site like Upwork, for example, they are growing extremely fast, so I highly, highly recommend everybody to look into that. Some people, it’s difficult. They think that, “Oh, I need to only work for big company or traditional company,” but I highly, highly recommend everybody to understand that the future will be that. It will be all about gig in economy. Mark S A Smith: Well, I think that people hae to understand that the big companies are not a source of stable income. The Fortune 500 loses half of its members every decade, and that’s accelerating. Mark S A Smith: Half of Fortune 500 wasn’t on the list a decade ago for a number of reasons. One is Martec’s Law, which talks about the fact that technology grows exponentially, but organizations grow logarithmatically. [crosstalk 00:26:51] 10% per year, year after year, until they reach the cognitive capacity of their leader, but technology doesn’t even consider that, and so there tends to be this huge gap that’s created between the technology available and the technology being used by the company, which forces a reset in the company on a regular basis. Thinking that a company is going to provide you with long-term stability is just ludicrous. Another data point is that of a Dow Jones Industrial Average. There’s only one original company in there, and they’re about to come off the list. That’s GE. The gig economy, friends, is the only way that you’re going to be able to keep up with the technology changes required for you to stay gainfully and joyfully employed. Mark S A Smith: Here it is. I just pulled it up in your book. It’s estimated that up to 50% of the workforce in the US will become comprised of freelancers by 2020. 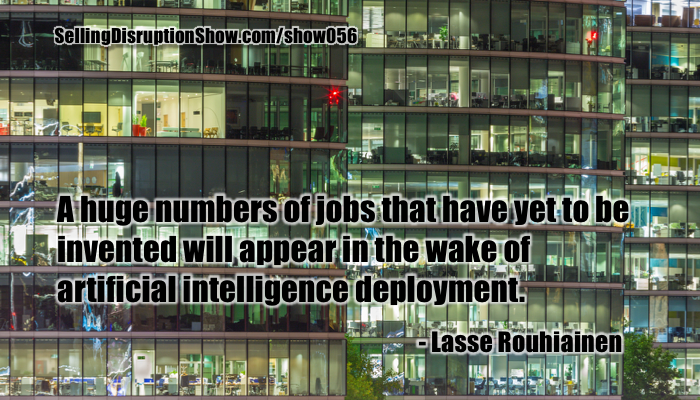 That’s in item 48, What’s the Best Way to Hire Talent to Work with Artificial Intelligent Technology. I’m quoting your book here, Lasse. Lasse Rouhiainan: Awesome, awesome. Thanks for pointing that out. Mark S A Smith: What a great conversation, one that’s really important for the future of everybody listening. What should they do next? How should they get a hold of you? What do you want them to do? Lasse Rouhiainan: Simply to go to Amazon, and over there, you can get the book, and Amazon allows you to read two first chapters or something like that for free. 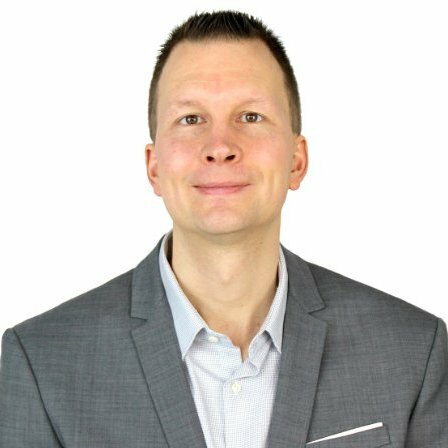 Lasse Rouhiainan: You can check it out or you can visit on my website, but I would say that right now, the book is quite exciting because there’s a lot of information that’s really timely that will help a lot of people if they understand how to apply it right now and start thinking about their future. Lasse Rouhiainan: Artificial Intelligence: 101 Things You Must Know Today About Our Future. Mark S A Smith: You can also find that link on the show page. I’ll also put Lasse’s website up there, as well. What a delight to have this conversation with you, and, finally, you and I get to have a conversation after having chats for quite a while. Lasse Rouhiainan: Exactly. Exactly. This was great. Also, thanks for your analysis of the book and all your kind words. It’s exciting to have this conversation here. 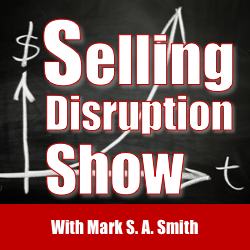 Mark S A Smith: That’s what we do on the Selling Disruption Show.